today I successfully replaced the floppy drive in a FM-TOWNS Marty 2 console.As replacement I chose a Samsung SFD-321B FDD (REV. T3,WT-4 PCB revision) since it's very common and can be easily modified to 3-MODE support an therefore read/write 1.2MB formatted discs of this console. The original FDD of the FM-TOWNS Marty console (1 and 2) is a EME-215FS manufactured by Matsushita with a 26PIN FFC connector (1.25mm of pitch), no info were available about so I first analized it and came to the conclusion that its pinout was the same of a slim 26PIN FDD for PC ( which comes with a FFC connector too but pitch is 1.00mm).And I was right since after building a small adapter from the 26PIN FFC connector (I took the one from the FDD itself) to 34PIN it worked fine, I coul read/write/format 1.2MB 3.5" discs on my console. Well, now you will be thinking that using an HxC Floppy emulator instead the Samsung FDD would work straight so we can say bye bye to the original drive once for all. The answer is no! Sadly I can't get it working and the worst thing is that I can't understand why. Well, when I use the SD HcX Floppy Emulator with this adapter, the track counting is stuck on '00' and YELLOW and RED LED stay always ON (see picture on my album). I tried all possible options in the 'HXCSDFE.CFG' but without luck. It must work since the Samsung SFD-321B is a common FDD, not special features or VFO circuit are present. I think that with a bit of help we can figure this out and make people with this japanese console happy! So, Jeff, pardon if I call you but shed light on this, please! Is the floppy ribbon connected to the right way ? Yes, Jeff, it's connected in the right way though judging from the symptoms (floppy access always ON) it could seem wrong. Disk images are like the X68000 and PC-9821 ones, so 2 sides, 77 tracks per side, 8 sectors for track and 1024 bytes fopr sector.Any idea? 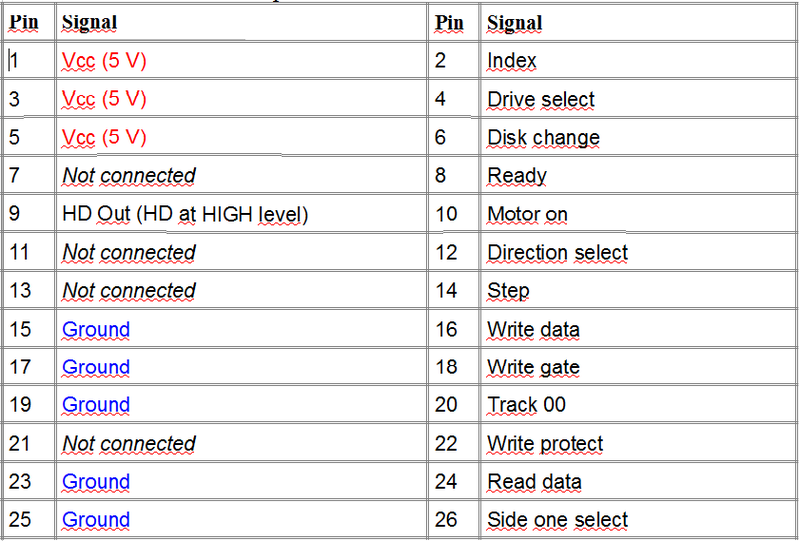 Is it normal to have pulses on drive select signal from Marty console (you can see it from the snapshot of the logic analyzing I did). ?I tought this signal was a simply active low one. caius wrote: Yes, Jeff, it's connected in the right way though judging from the symptoms (floppy access always ON) it could seem wrong. What about the RPM/bitrate ? Is it a 360RPM drive ? Yes, the original FM-TOWNS Marty FDD is 360RPM.I modifed the Samsung SFD-321B (which originally spins at 300RPM) to 2-mode (you can also do 3-mode but Marty console doesn't read 1.44MB so it's useless) so now it spins at 360RMPM and can read/write 1.2MB formatted discs, it works fine.Bitrate is 500kb/s.Disk images are the same format of FM-TOWNS PC, PC-9821 and X68000 (most of times they come under .D88 format but also .XDF and raw .BIN). I rewired my adapter but nothing has changed.For me this is a real mistery why HxC doesn't work as replacement of the Samsung drive (which replaced the original Marty FDD).Maybe, Jeff, your devices doesn't like some input signal generated by the host or the host doesn't accept some output from HxC, this is the only explanation I can give.The fact is that the Samsung SFD-321B drive works perfectly as replacement.I attach a couple of disk images but , again, they are the same for the FM-TOWSN PC whose drives are fully emulated by HxC. I also tried to manually tie LOW the disk select 0 on HxC instead of using the signal from the host but the track reading doesn't start and it's always stuck on '00' with YELLOW led permanently lit. Have you tried to change the interface mode into the embedded menu ? Have you tried to change the bitrate into the embedded menu ? i think i remember that someone else make it work some years ago. Jeff wrote: Have you tried to change the interface mode into the embedded menu ? I tried various interface mode saving different HXCSDFE.CFG configuration files.For embedded menu do you mean the one on hardware?No, I haven't tried it.But isn't it the same thing of changing HXCSDFE.CFG? As far as I know none has succeeded in replacing an FM-TOWNS Marty FDD with HxC but I can be wrong.For sure it works with FM-TOWNS PC since I tried it.try to remember who was this guy. I can measure +4.8V from console PSU, I tried to power HxC with an external PSU but nothing has changed.I don't think logical level are altered by this low voltage so HxC cannot work properly while the Samsung SFD-321B still works because has CMOS level input. -> Use the default CFG file. -> Set the switches ID0-A+ID1-A+ID2-A+ID3-A in the same time. -> Use the embedded menu to try the various interface mode. OK, will do and report feedback.Thanks. I tried all you suggested me without luck.It's really weird. If you want I can send you all the needed hardware for testing. This may cost a lot, isn't it ? Jeff wrote: This may cost a lot, isn't it ? I don't think it will be very expensive to France (around 30 euro with standard shipping if within 5Kg).I'm located in Italy send a lot of package all over the world.The FM-TOWNS Marty 2 console is quite small and light, I will inlcude also the adapter , the original drive (although without connector which I used for the adapter), the Samsung SFD-321B FDDs, a 220--->110 AC converter and if you want my HxC though I'm 100% sure it's not defective since I successfully tried it with other machines. Today I made other tests and came to the conclusion that this console can handle only 2HD 1.2MB floppy disc although the operating system can let you choose you to format disk at 720K and 1.44MB (maybe this is a feature for the FM-TOWNS PC). So, it's really weird why your HxC doesn't work while a common FDD like Samsung SFD-321B does instead. I have the 220->110v convert + i may have access to an FM-TOWNS Marty here. I just need the adapter + floppy ribbon. Jeff wrote: I have the 220->110v convert + i may have access to an FM-TOWNS Marty here. I just need the adapter + floppy ribbon. OK, we can do this if you want.I think it's important to test your device with as much as possible machines.I really don't know what is wrong.The Marty console works perfectly with a gneric FDD like a Samsung SFD-321B (and surely also with other 1.2MB FDDs) so there is no reason why it shouldn't work also with an HxC Floppy Emulator. Also yesterday I played with other HxC settings changing the signal on PIN 2 and PIN 34 but I got no results,there is still no reading of the tracks and floppy access LED is stuck ON.Let me know if you have in mind other things I can try.